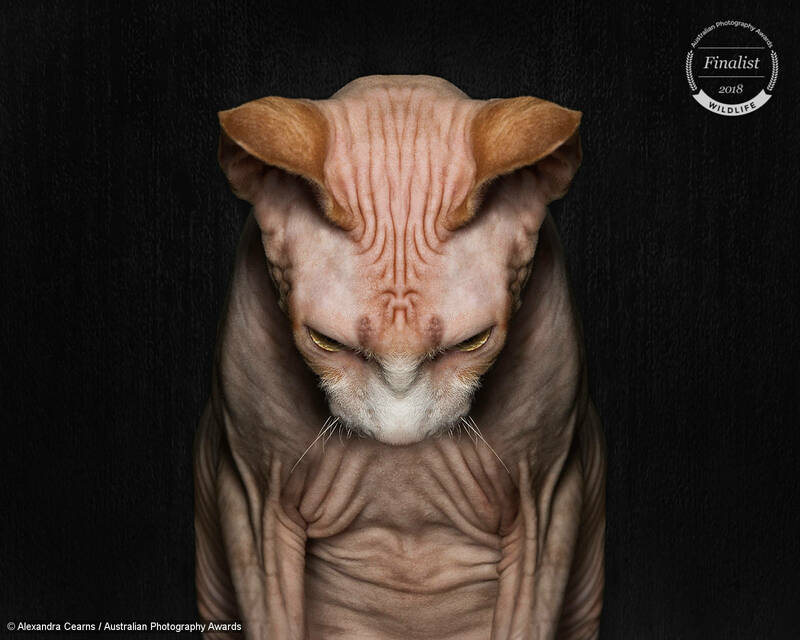 Thanks for joining me, APA competition judge Matt Palmer, as I look at the winning Australian Photography Awards Wildlife photograph of 2018 as well as looking at what made the rest of the top ten so successful. The wildlife category in 2018 was highly contested and featured wildlife both common and exotic. I think the category was taken to new heights and wildlife photographers have been so successful in documenting interesting animal behaviors and scenes in nature. The top 10 is calling, so here we go! Herd Of Cattle was an early stand out in our wildlife preliminary round of judging and enthralled the judges since. It may seem strange to award a wildlife photography award to a documentation of cattle, given just how common cattle is. We’ve likely all driven past this kind of scene at one point or another and thought nothing of it. It’s when a photographer captures an incredible shot of the every day that their skill is proven, and this is one of the shots from this year’s competition that really made me think… Why didn’t I do that! Of course, it’s simply because the thought hadn’t crossed my mind like it had Ryan’s. Technically Ryan is very clever with his approach to the herd, using a long exposure to capture the movement of each individual cow. Cows are very curious creatures and they will often investigate you as you photograph them. They stand on the spot, moving their head about, and jockeying for position. The long exposure captures all of that behavior beautifully. Ryan also integrates a broader landscape to support the scene. The mountain range is frozen by shooting from a tripod, and the clouds and their movement offer a nice balance in the sky. 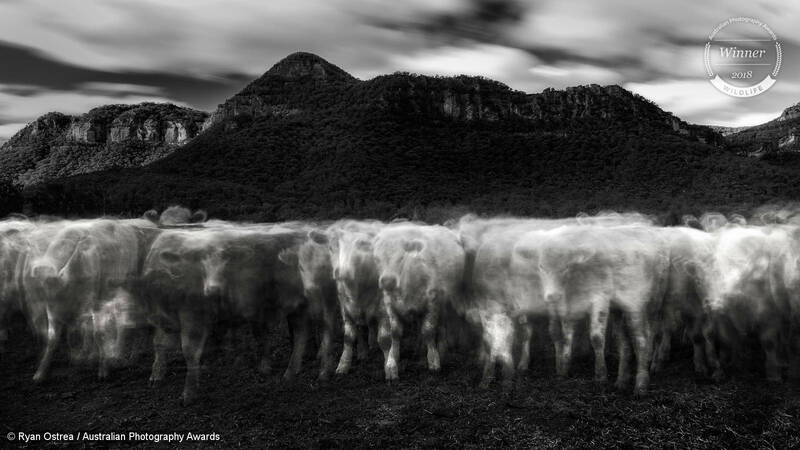 Everyone involved in the Australian Photography Awards is thrilled to have Ryan Ostrea’s ‘Herd of Cattle representing the wildlife category as its winner in 2018. I’m a fan of shooting in awful weather because you never know what you might find. 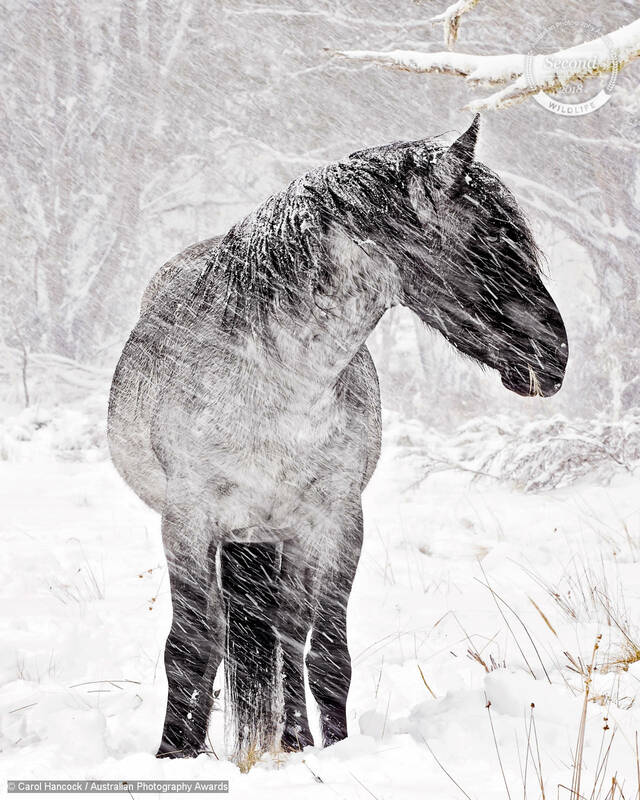 Carol does an amazing job of capturing this Australian brumby patrolling for threats near his herd while shooting through a blizzard. Despite the substantial snowfall, the scene feels distinctly Australian due to the gentle supporting background. There is also a great sharpness to the brumby and Carol did well to capture him with his eye free of interference as the snow blew past. Achieving this often necessitates shooting bursts to attempt to have the most important areas of the photo free from streaking snow. Overall it’s a very beautiful animal portrait captured in trying conditions that really make it special. 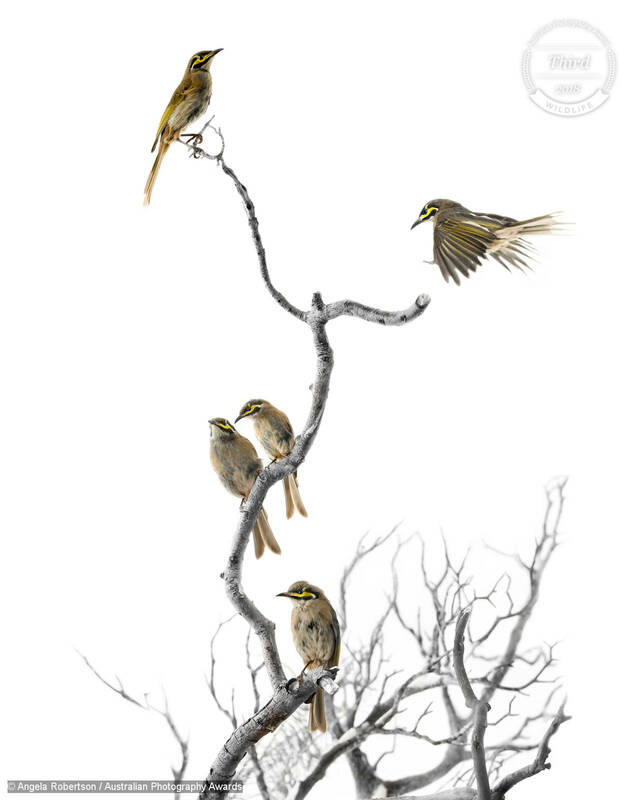 There is so much beauty in this capture of yellow-faced honeyeaters forced into suburbia. The bright sky turning to white coupled with the immaculate detail on the birds, and their varied poses make the scene reminiscent of the very best scientific fauna illustrations of species from times before photography. Like these sketches, each bird has its own individual pose, space, and position. It’s incredible that this scene was captured candidly. This photograph also highlights the destruction of natural habitat due to drought and man-made interference which forces these species to search for food outside their normal habitats. Angela is also a wildlife carer, and we appreciate her care for our Australian animals! This dramatic and unique portrait lives up to its title. Alexandra’s portrait of Kewpie the sphinx drew an instant reaction from all of our judges as this brooding image came up. It has a huge impact which is assisted by the strong directional lighting and the downward gaze of the cat. The slither of light hitting Kewpie’s golden eyes is just enough to create the grim expression, and the furrowed brow is a very strong supportive detail. We won’t be messing with Kewpie any time soon! Jon describes the diver in his photograph as being caught in a fishnado. 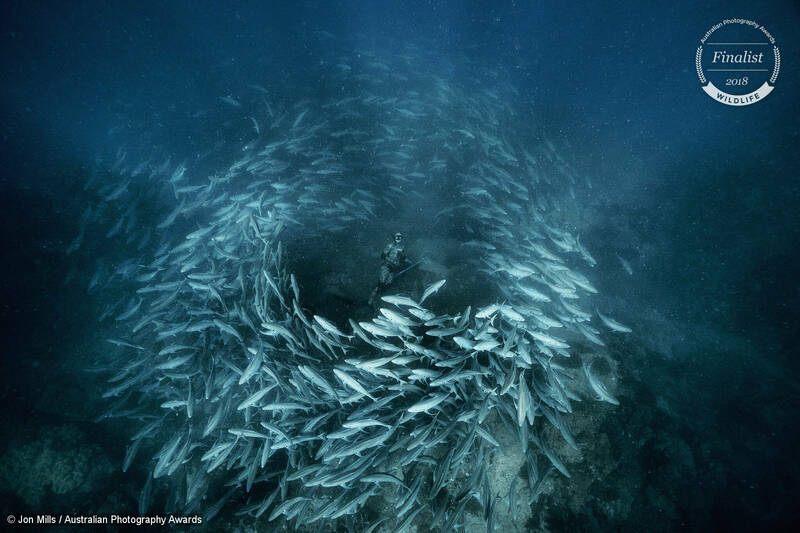 There is so much dynamism to this capture which shows the schooling behaviors of trevally. It also doubles as an amazing and dramatic portrait of a diver in their environment. The colours in this capture are also rich, with varying shades of aqua and blue creating depth in the scene. The detail on the foremost trevally is also quite incredible, and this fading into the out of focus trevally behind also helps create a sense of depth. If I were the diver, I would be ecstatic with this capture! Tony uses the perspective, shooting from a bird’s eye view, to give us a glimpse at what lies beneath. 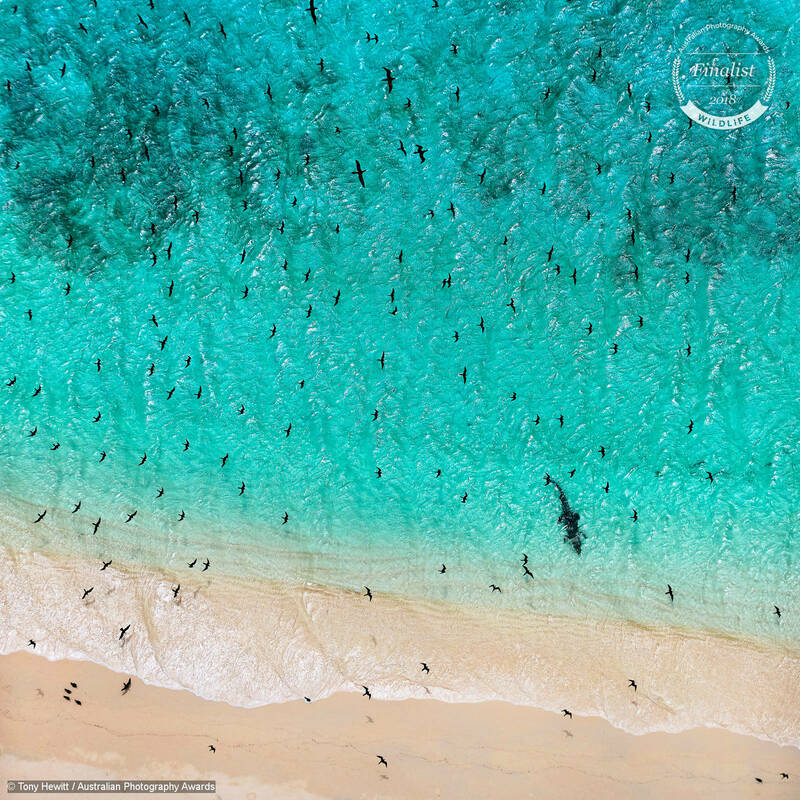 The patterns created by the birds at varying altitudes creates depth in an otherwise flat scene, and the birds closest to shore casting shadows on the beach is a nice touch that gives an impression of their closeness to the ground. There is also a wealth of texture in the ripples and highlights of the waves that combine into dramatic patterning over the ocean. The crocodile is, of course, the star of the show, lurking beneath the surface, unlikely to be visible at all from the shore. It’s this cleverly used aerial approach to wildlife that gives us this unique access to a crocodile in its habitat and creation of a stunning piece of art. I feel blessed to have viewed Sally’s documentation of the fierce survival of gannets in a way that I haven’t seen before. 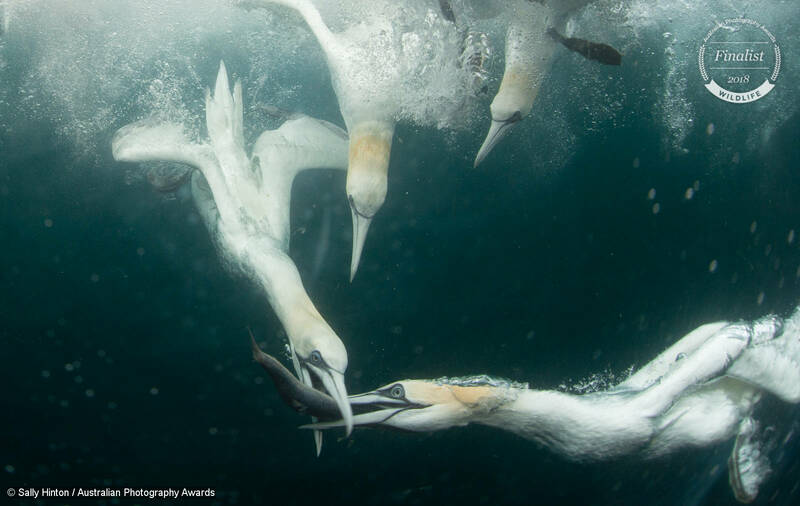 This scene is full of drama as gannet after gannet plows into the water in competition for food. The timing and anticipation of this shot are excellent, these moments last milliseconds. The photograph makes me want to find out more about these birds and I hope Sally keeps creating this impactful imagery of them and their everyday battles for survival. Someone forgot to tell Zoe that you’re supposed to have an amazing camera and massive telephoto lens to photograph birds. 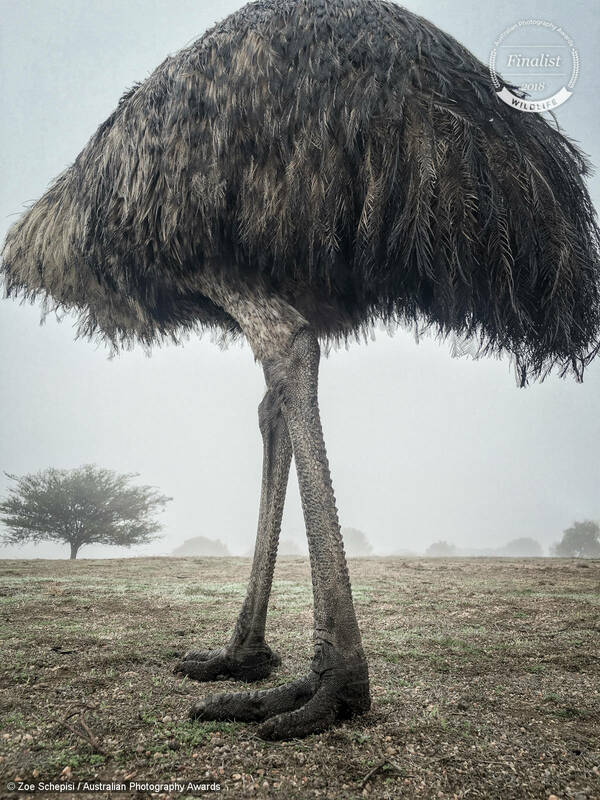 Zoe is our mobile category winner for this amazing wildlife photograph of an emu, and it’s so cleverly composed and captured that it finds a place in our wildlife top ten as well! Zoe cleverly uses her mobile close to the ground, creating a perspective where the emu’s head and neck disappear behind its body. This allows Zoe to explore an extremely deliberate comparison of emu and tree. The detail in Emu Tree is incredible, with texture in the legs, feet, and feathers that you can almost feel. Emu Tree proves that a little inventiveness and vision there is no obstacle to getting out there and creating! 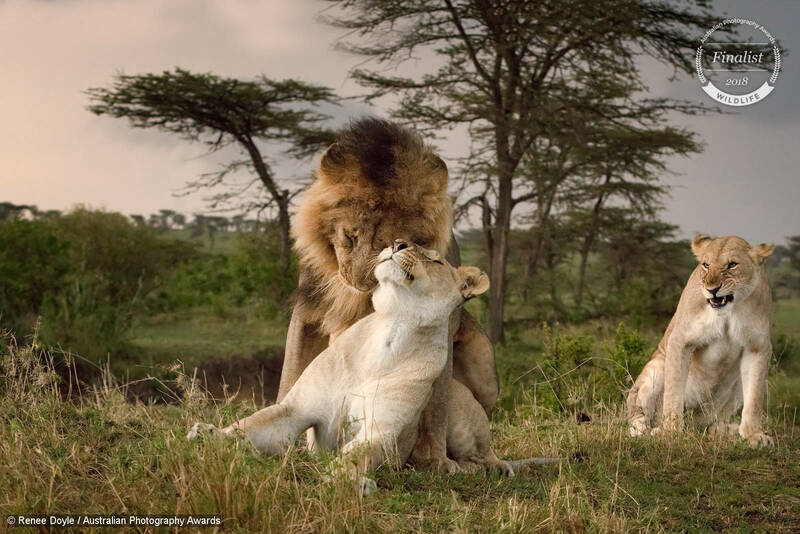 Jealousy is one of the strongest lion photographs I’ve seen in terms of narrative. The sister of the lioness whom is the subject of ‘attention’ is framed against the edge of the frame, which visually communicates her being left to the side. Her scorned expression is palpable, while the central lion and lioness have very tender expressions that are well captured. Renee also used the stunning light created by an approaching storm and sunset to bring out the gorgeous tonality in this scene. Pretty In Pink captures a brittle starfish searching for food as night falls in the Philippines. It transcends its genre to become a beautiful piece of natural art. The barrel sponge creates a complementary colour palette for the starfish to be photographed against and the colour palette is reminiscent of that used in Australian Indigenous art. 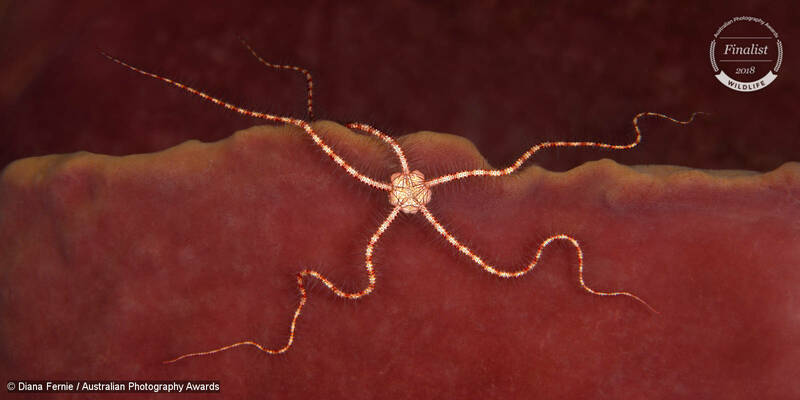 The detail is quite incredible, with sharpness throughout the brittle star’s legs which can reach up to 60cm in some species! Diana is successful in creating a photograph that would look amazing on a wall even without explanation. Thank you for joining me as I discuss our Australian Photography Awards Wildlife Top 10. It’s been the most enjoyable year yet judging your amazing wildlife photography, where we not only see innovation and adventure in photography but also learn more about our beautiful natural world as well. Thank you for your entries this year and let’s look after this beautiful planet of ours!